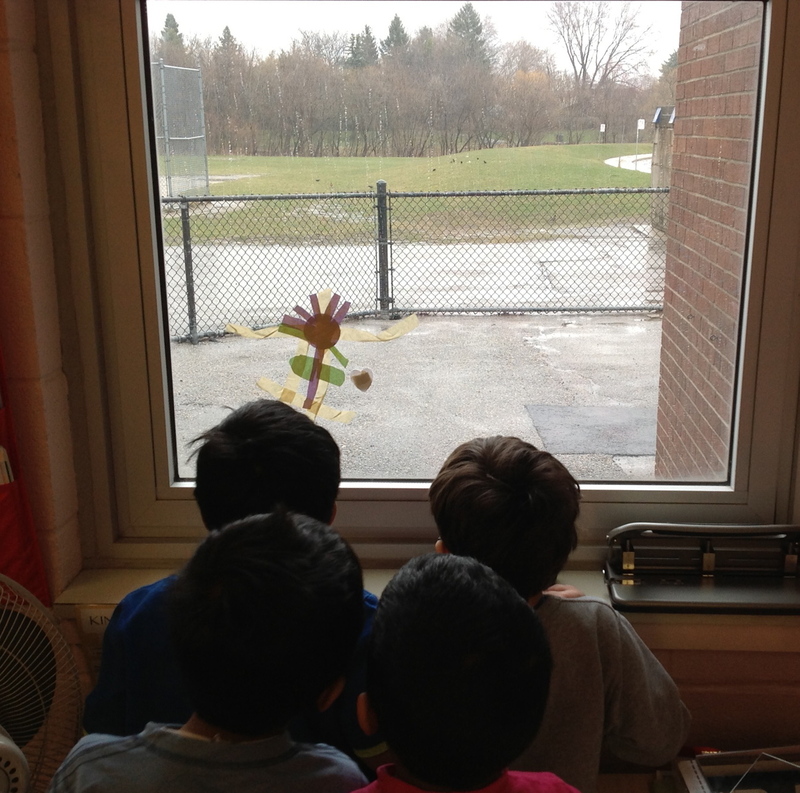 Some PM class friends watching starlings and robins hunting worms in the rain. 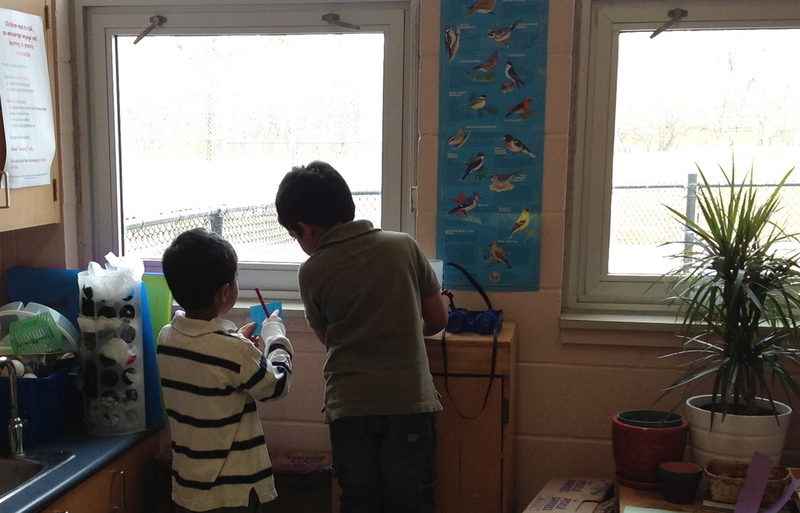 Last week I described how the current bird inquiry began back in early spring when two boys came to school excited about some "red birds" that they'd seen before school. I think back to my early days of teaching Kindergarten, when I didn't ever enter the classroom without a lesson planned for that day. Interesting stories bubbled up at entry, outdoors, and on the carpet, but they were never the "meat" of the program. Yes, I encouraged talk as it helped encourage listening, sharing, and using rich vocabulary. No, I didn't know how to use their interests to steer my planning for what to study, for how long, or with what materials. Some four or five years ago, I was introduced to Tony Stead by a teaching partner and friend. In his book: "Is That a Fact?" he offers ideas for teaching non-fiction reading and writing with strategies for even the earliest readers. 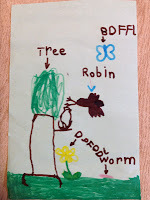 I was intrigued by the idea of students using the illustrations and photos to gather evidence for their projects, and thus my first attempt at project work was born. It was spring and the lawns around the school were covered with robins hunting for worms, so introducing birds seemed the natural choice, not the least because I am smitten with birds. I used mixed-age groups that were already formed for rotation during activity time, for at the time I would work with one group each day. The groups were given a selection of local birds to choose from, and I gave four guiding questions: 1) What does your bird look like? (including male and female if different), 2) Does your bird stay, or fly away for winter?, 3) What does your bird eat?, and 4) What do your bird's eggs and nest look like? Groups each had a chart paper on which to draw and label what they found out in answer to the four questions. There were successes and struggles. I now see that the struggles naturally occurred because the groups were not self-selected, nor were all the children invested in the product. Thus, each group had one or two excited members who pored over the texts and drew elaborate pictures, while other members fidgeted, complained about their lack of space, or otherwise withdrew. It was an eye-opener to me to see how little my students knew how to work with a group. It was an eye-opener to see how little I knew about preparing students for collaboration, self-regulation, and stamina in project work. 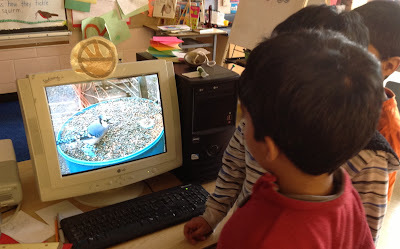 A group of boys watch a movie about a bird feeder with many local songbirds. They call out the name as each new bird that arrives, and cheer when their favourite bird chases another away. The shouts and laughter draw a small crowd of onlookers until nearly the entire class are watching and cheering for their favourite birds. In the years since I've abandoned thematic planning for a more reflective, collaborative method of preparing for each day, I have noticed that my students are much more engaged in their pursuits. Children have taken ownership over parts of the program to the extent that I don't know which centres will be open each day; I merely ensure I have plenty of materials to choose from. 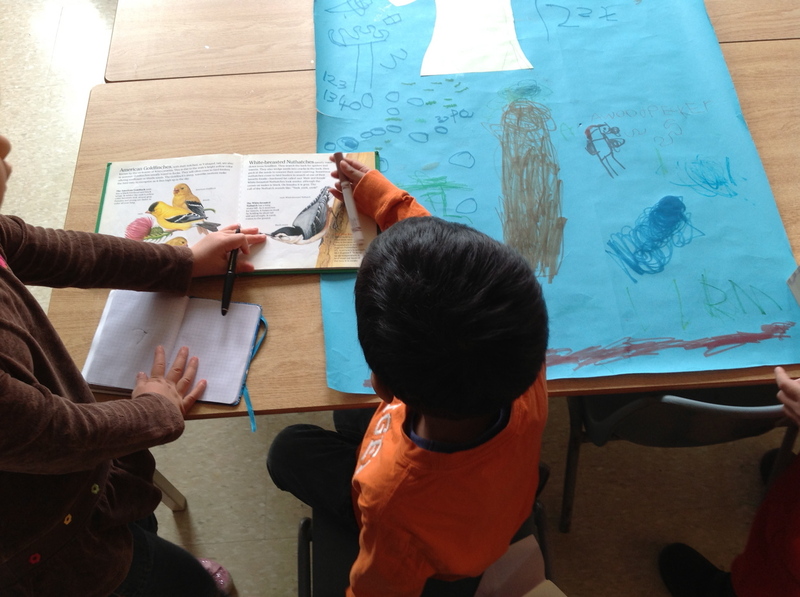 The most delightful discovery I've made since adopting an emergent curriculum is the way that students need little prompting to read and write, once they've identified a topic worth sharing with others. The photos below represent a range of artifacts created by students during the free-choice activity time. 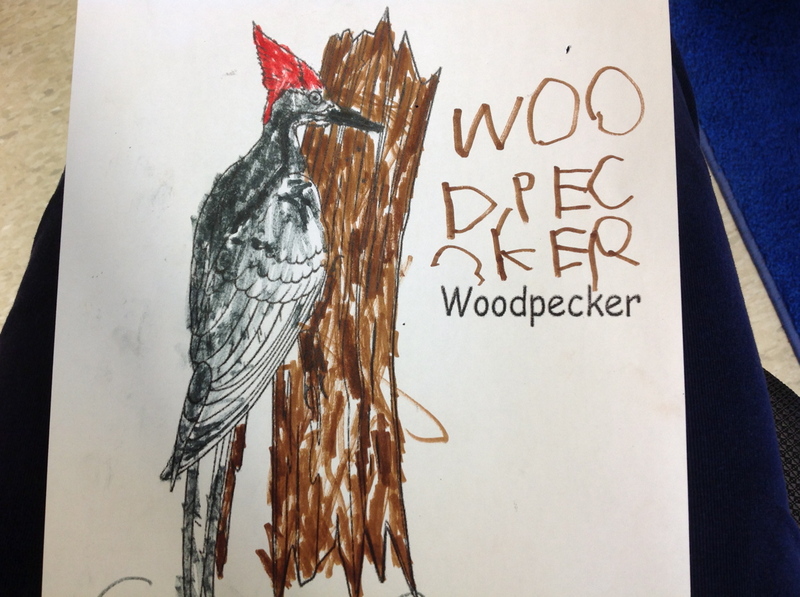 A few students requested pictures to use for books, so I took them to my computer and looked up colouring pages. I printed each one that they requested, and then let them use those pictures as they wished. The dedication to uncovering the facts is evident in the details of each work: accurate colours copied from field guides, labeled diagrams, research for self-made "I Can See" books. Students in my classes know that in order to be asked to share during "sharing time", they must sign up with some sort of note, even if it is an artifact that they wish to share. 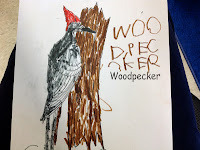 During the last month, the topic of birds has led to interesting "noticings" being posted about different bird behaviours. Here at the left, two boys in the afternoon class are using binoculars, consulting the bird field guides, and writing a note to share with the class. Here students are using the pictures and known words to learn about interesting birds to add to their collaborative research poster. 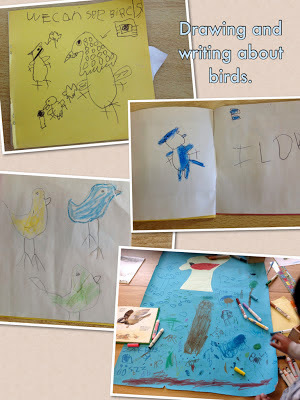 I had put the blue paper out one day as a provocation, with the title "What We Know About Birds". I had chosen some recycled bulletin board paper to match the blue of our birdwatching poster. 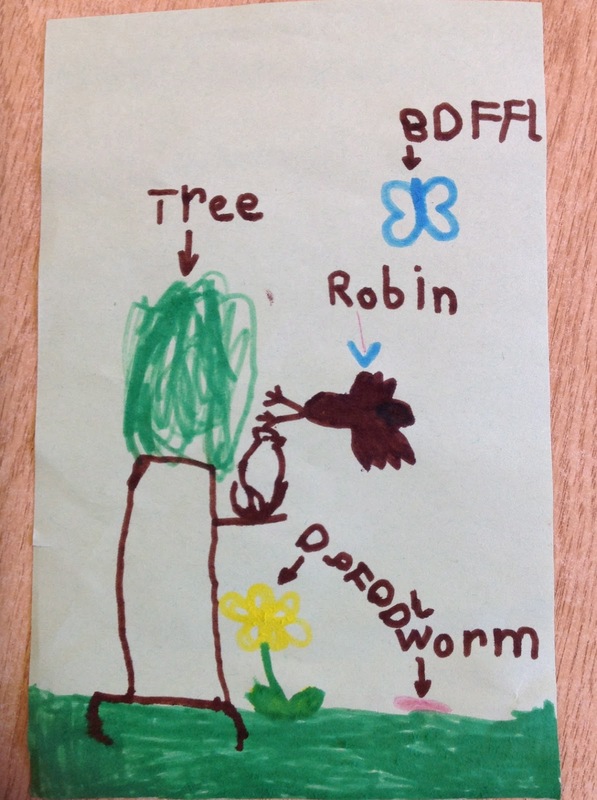 The invitation was taken up by J who carefully drew and labeled the body parts of a robin while a friend drew a woodpecker flying in from the side. When the afternoon friends saw the work, several students were excited about adding what they had learned to the bottom, requesting that I show the morning friends what they had to teach. When my students are interested in a particular topic, even if it is a small group engaged in the inquiry, I like to find links to sites and video clips for them to explore further. I link these on my PDSB-hosted class site for students to access at home whenever they like. It is here that I share our Voicethread books, photos from each month in class, and news. For the growing group of birdwatchers I linked videos of specific local songbirds and one heart-breaking, lovely video about a robin's nest from egg to flight. We were so engaged in our latest project that I was finding it difficult to visit the "We Can See" blog these days, with so much of our time at the end of the day being dedicated to sharing our daily learnings. I was happy with the direction of the talk each day, even if it meant some days there was simply no time even for a read-aloud. 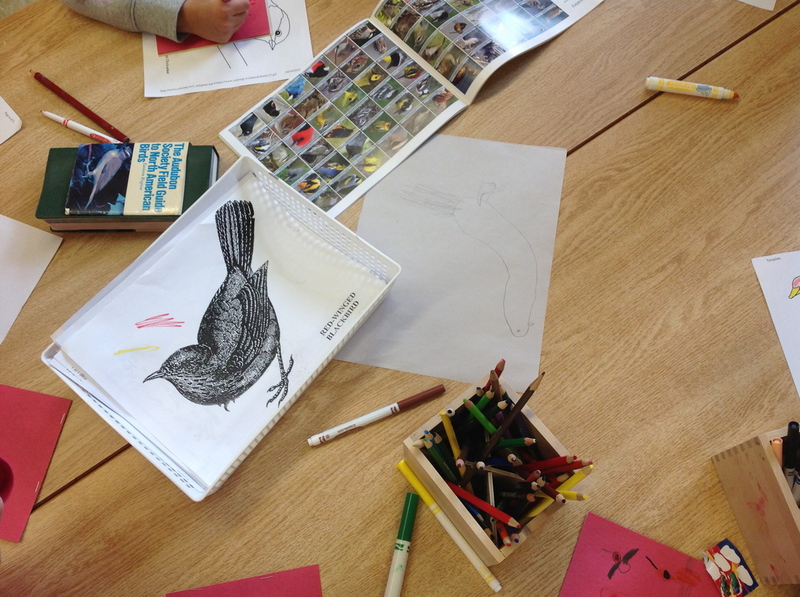 It was a very happy moment indeed, when morning friend J suggested we make our own "We Can See" book, not about spring, but about birds! I told her I would share her idea with the afternoon class, and gave her a high five for such a marvelous idea. Here is our book, so far. The wonderful thing about making a Voicethread book is that it is very easy to add on each day as new ideas come forth. Next week the book will certainly have grown! Last week, the morning friends and I went for a walk with our friends from down the hall: Ms. Silva's class. We had some exciting encounters, some of which are sure to show up in our Voicethread. The story of our bird-watching walk, along with some of the individual "I Can See Birds" books, will be the subject of part three. Our class watched/listened to your class book on the We Can See blog page. We have left your class some compliments and questions. Thank you for sharing with your class. My students were so happy to hear from friends in another room 109 Kindergarten! They had more questions about your letter. We also watched your new spring movie. Both classes enjoyed it and had comments and questions for your class. Now, if only my board didn't block Skype! Perhaps we could try Peel's "Big Blue Button" and chat sometime. 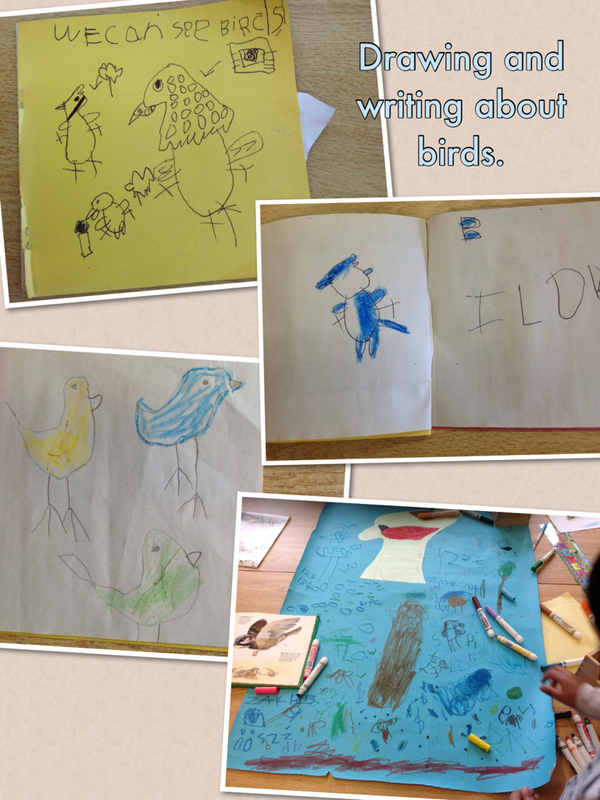 My bird experts are keen to share their learning.